Hear the tyres scream in the second edition of the 4 wheels racing game by Black Bean! 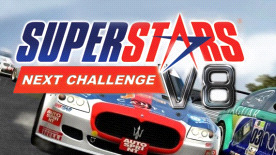 Next challenge brings the Superstars V8 series to a new level of realism and fun: New and improved in-game physics and damage, the exclusive Evolving Track system and the cockpit view lets you enjoy speed and adrenaline like never before. Plus, top-class cars from 7 different manufacturers, living and breathing 3D environments and online multiplayer for up to 16 challengers on the track at the same time! Gianni Morbidelli, the last 2 years champion of the Superstars competition, has contributed to the fine tuning of the car behaviour and the tracks layout. Features - up to 16 players online - Realistic settings with many performance and aesthetics improvements - Exciting tracks, extremely realistic graphics and physics. - All the official drivers including champions such as Gianni Morbidelli and Stefano Gabellini - 19 faithfully reproduced cars racing simultaneously such as BMW 550, Jaguar S, BMW M5, BMW M3 e Audi RS4. - All the official tracks such as Mugello, Monza, Valencia, Adria, Misano Adriatico, Adria, Kyalami, Portimao e Vallelunga and other never published before tracks such as Magione e Varano.